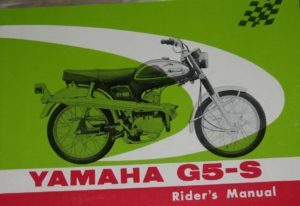 Yamaha Motor Company, Ltd. was established in 1955 as a small subsidiary of Nippon Gakki, Ltd., the world’s largest piano manufacturer. 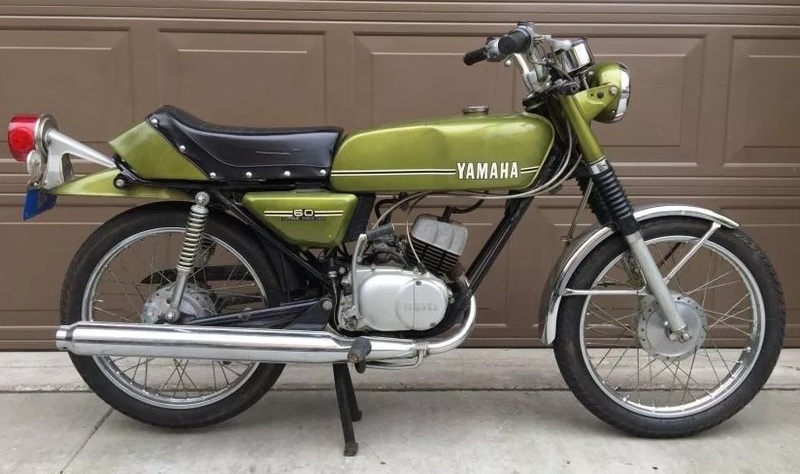 The firms entrance into the field of motorcycle production was hardly considered a threat by the giants of the industry, but after the first model was introduced and marketed later that same year, they quickly realized that Yamaha would soon be a formidable competitor. 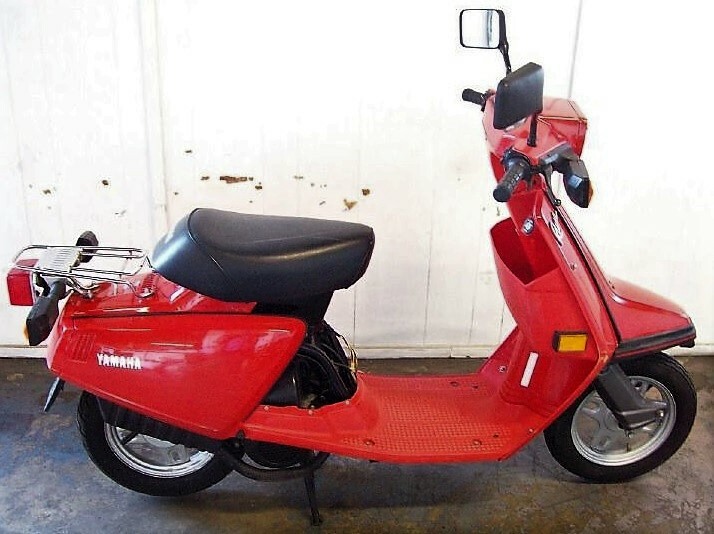 The first Yamaha was designated YA-1 and dubbed the “Red Dragonfly”. It was styled after the famous BMW and was powered by a single cylinder 125cc two stroke engine. 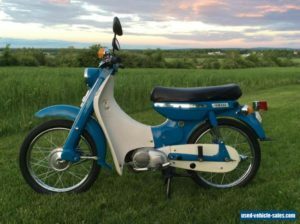 This first effort was such a success that by 1959, the company was offering sports and utility models in 125, 175, and 250cc displacements. 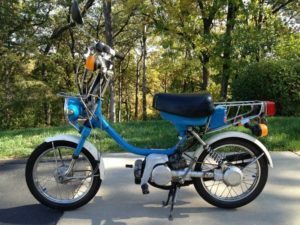 In 1960, their phenomenal growth continued, multiplying their original investment nearly thirty times and expanding their product line to include mopeds, boats, and outboard motors. 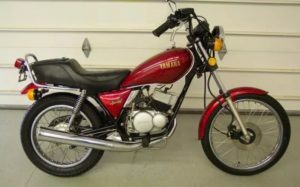 By that time, Asian export market had already proven very profitable, but it wasn’t until the early-to-mid-1960’s that foreign sales really began to soar: America discovered the Japanese motorcycle and suddenly the demand for them became overwhelming. The motorcycle industry’s heated competition for this new market was eventually carried to the European Grand Prix circuit, where Yamaha and their rivals locked horns in a furious racing and development battle. 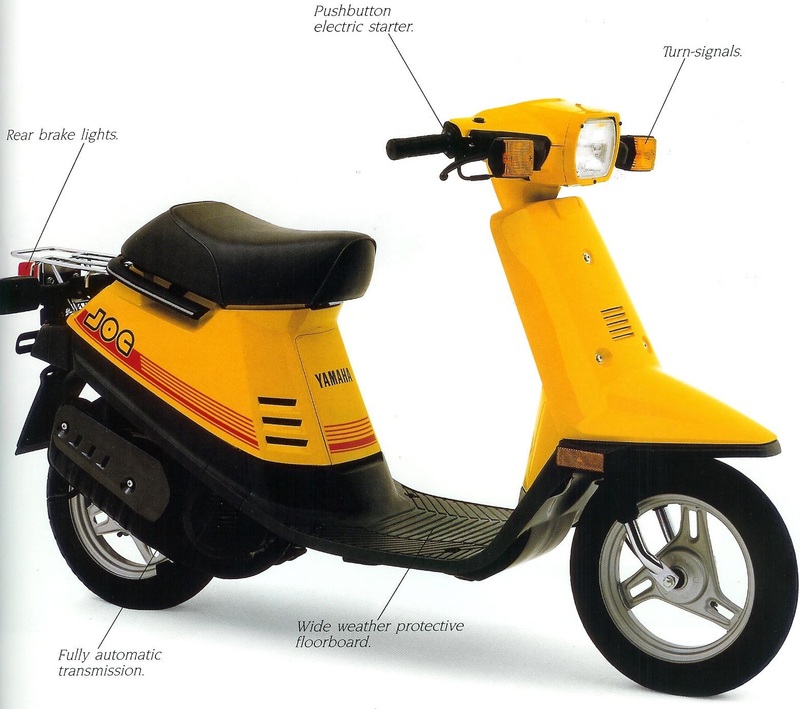 Factory engineers worked frantically to provide faster and more powerful machines for the Grand Prix effort, and as a result, two-stroke motorcycle technology advanced by leaps and bounds. 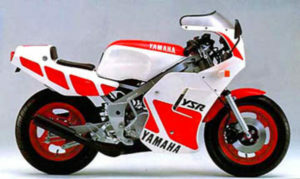 The Yamaha racing team won five world championships. After development and thorough testing the products of this racing program were employed on production machines: mainly, the rotary valve in 1961, Autolube oil injection in 1963 and the five-port (twin intake port) cylinder in 1968, and the reed valve in 1973. 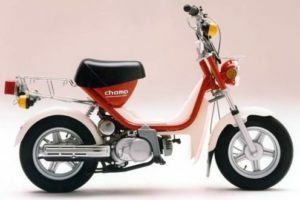 Meanwhile Yamaha Motor Company, Ltd. continued to grow – building nine new plants in Japan, Taiwan, Mexico, Costa Rica, Equador, and Guatemala. 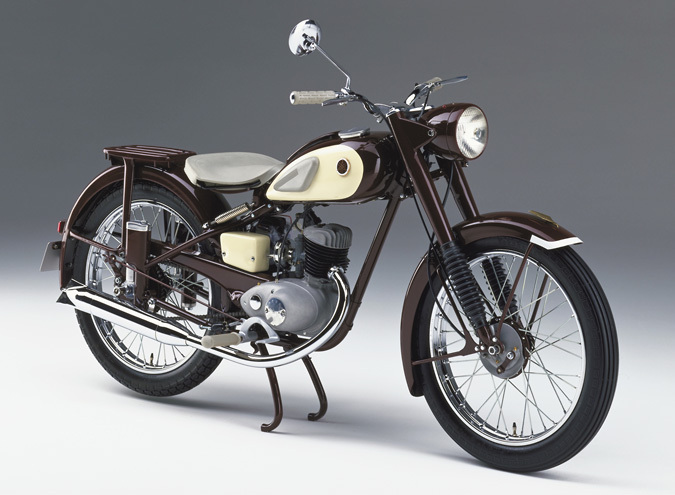 In addition to achievement awards in motorcycle engineering, the company also received great acclaim for their design of the Toyota 2000 GT in 1966, and the introduction of Yamaha snowmobiles in 1968. Most recently, the firm has built a new test facility in Japan and introduced a complete line of off-road Enduro and Motocross motorcycles. 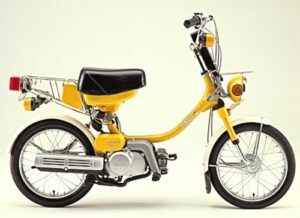 They have also expanded their street motorcycle offering by applying their Toyota 2000 GT experience to the construction of Yamaha’s first four stroke model-the 1970-1971 XS1. 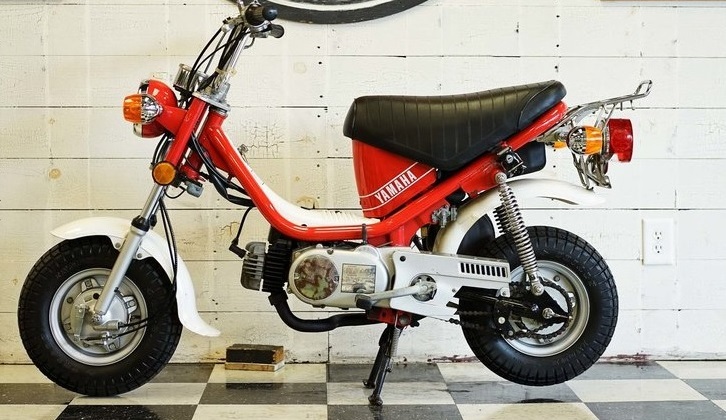 The Yamaha trademark of three crossed tuning forks has now become a familiar sight all over the world and serves as a subtle reminder of the firm’s musical origin. 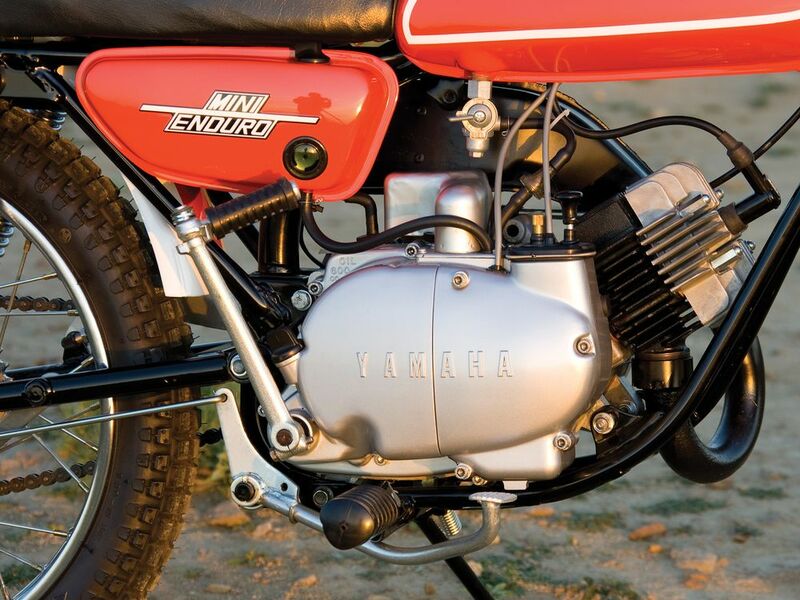 Their motorcycle products currently range from the 1971 58cc Mini-Enduro to racing’s “dynamic duo”, the 1971 250cc TD and 350cc TR road racers. 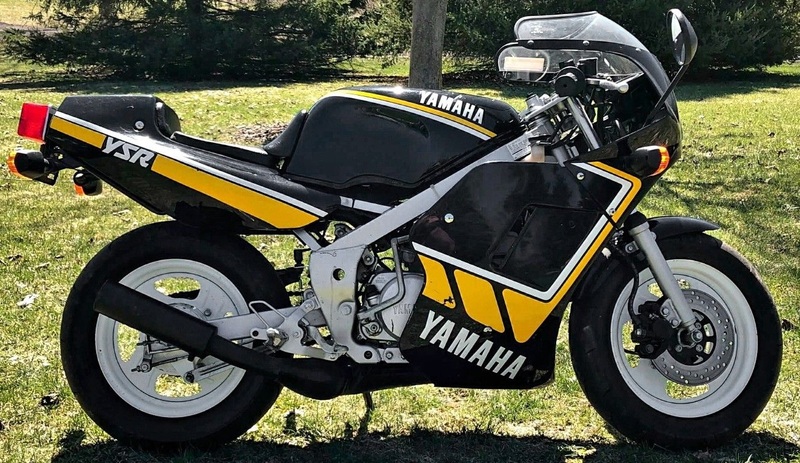 There is a model to suit every enthusiast and each one reflects, as Yamahas always have, the ever-growing interests of the motorcycling public. 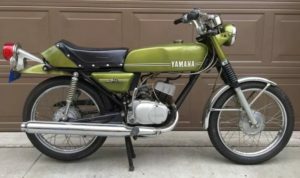 Here are listed all the vintage Yamaha motorcycle and scooter models that sold new in the USA. Worldwide there are many more Yamaha models. Some of those are the same as US models, and some are different. 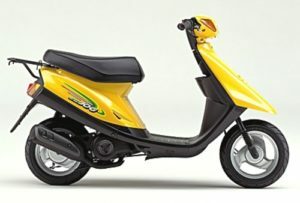 Here the focus is on the smaller 50-80cc Yamahas that are like mopeds. Many of those small Yamahas are also shown in photos and explained. 1964 saw the introduction of Autolube oil injection on all models. With the new lubrication system and other improvements, the YJ1 became the YJ2, the YG1K became the YG1K (same) and YGS1T, the YDS2 became YDS3C. With the addition of electric starting, the U5 and YA5 became U5E and YA6. 1967 saw new models YL2, YCS1, YR1 and primary kickstarting on some models. With the addition of electric starting, the YL1 became the YL1E and the YDS3C became the DS5. 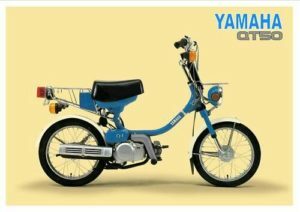 The new YL2C and YCS1 were also equipped with electric starters. 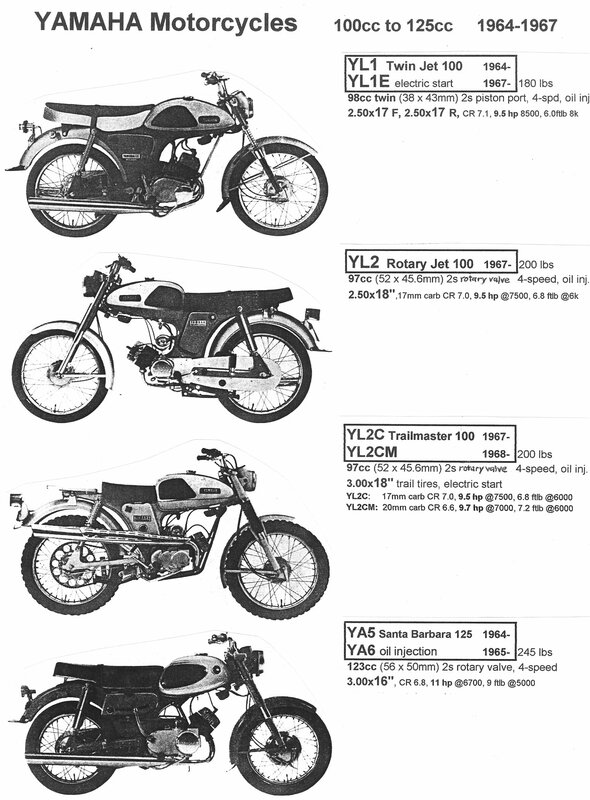 1968 saw the introduction of a new 5-port cylinder design on the DT1, YAS1C and YR2C. 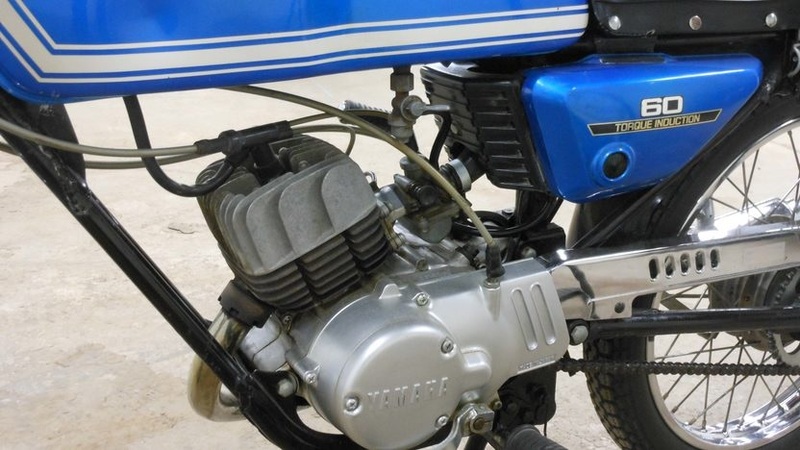 (5-port means 2-intake ports, 2-transfers, 1-exhaust) With the addition of electric starting and other changes, the YG1K and YGS1T became the YG5T, and the YCS1 became the YCS1C. 1969 saw new models AT1 (electric start), CT1, L5T (electric start and two-range, 3-speed transmission. 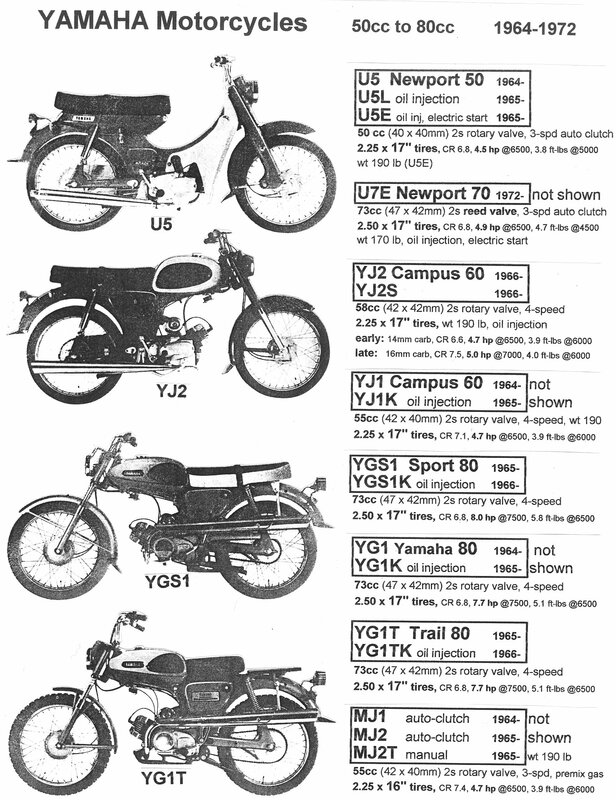 The YA1SC became the AS2C and the YG5T became the G5S (without electric starting). The DS5 of 1967 evolved into the DS6C (without electric start). The YR2C became the newly styled R3. DT1 became DT1B. The five-port cylinder design was now used on all of the piston-port (piston-controlled induction) engines. Rotary (disc) valve engines do not have any intake ports in the cylinder at all, so the new split intake port design did not apply to them. 1970 saw new models HS1, HT1, RT1, XS1 and the introduction of Keystone-type (trapezoidal or slanted-top) piston rings. 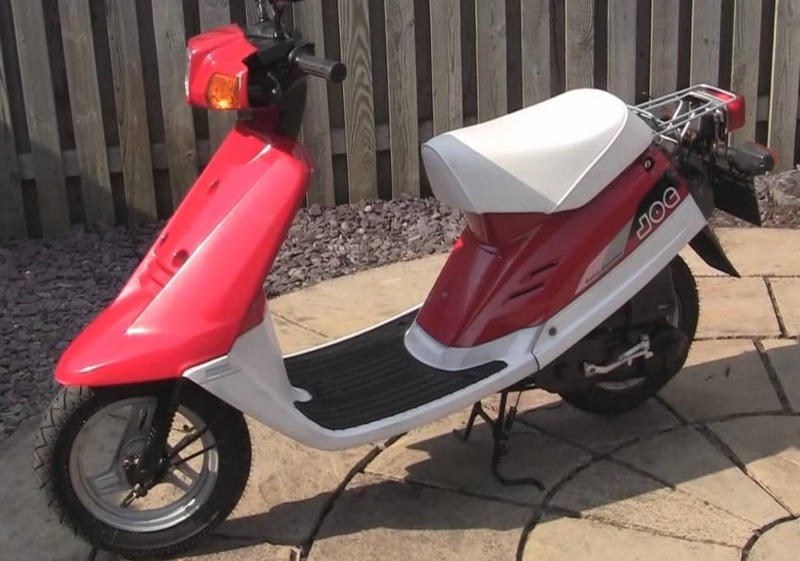 The YCS1C and R3 were completely revamped to produce the CS3C and R5. With new styling and internal improvements the G5S, AT1, L5T, CT1, DT1B and D6SC became the G6S, AT1B, L5TA, CT1B, DT1C and DS6B. The five-port cylinder was also used on the new HS1, HT1, and RT1. cover where the clutch normally is. 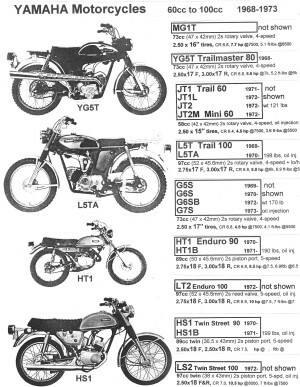 1971 saw the new JT1 Mini Enduro. All 1971 models carried a last letter designation change from their 1970 versions. 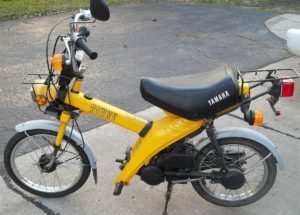 (Some end letters increased, like B to C, and others decreased, like C to B) For example, the HT1 of 1970 became the HT1B of 1971, even though very few changes were made. 1972 saw the introduction of reed valve induction on the AT2, CT2, DT2, RT2, and the new LT2 and U7E. The HS1 was enlarged to 97cc, restyled and designated LS2. The DS6 was completely revamped and designated DS7. 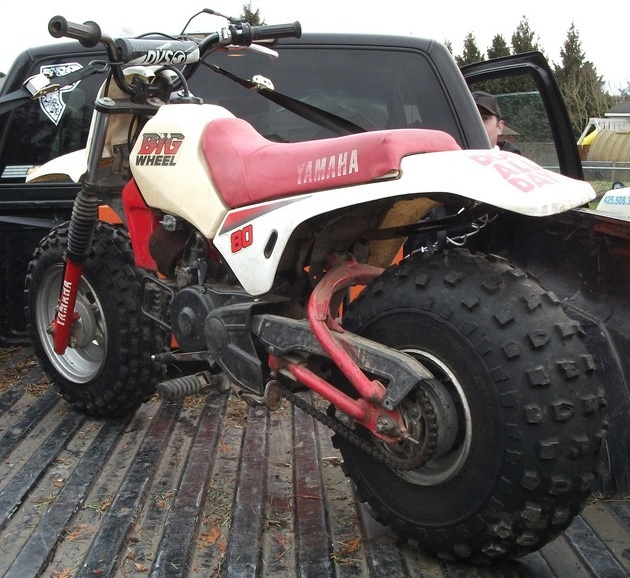 The JT1 Mini Enduro was made available in either street trim (JT2L) or off-road trim (JT2M). 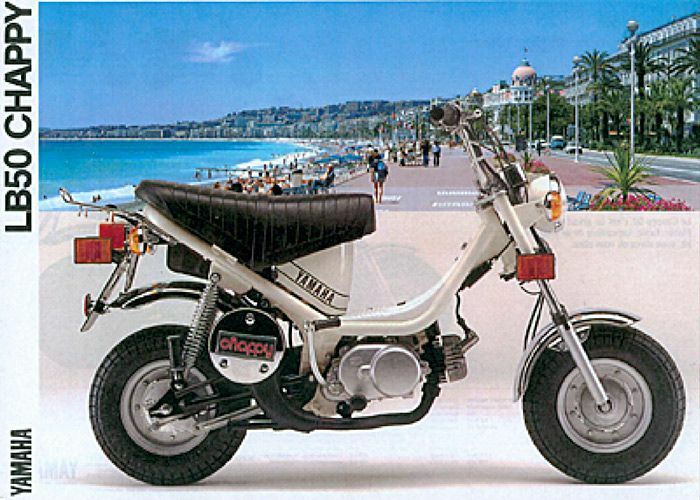 The XS1 was fitted with a front disc brake and electric starting, and re-designated XS2. 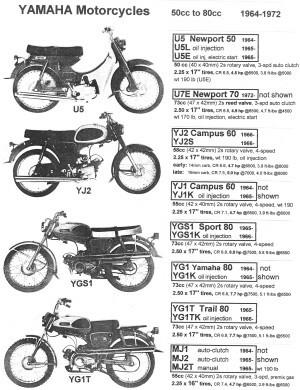 1969 to 1972 Yamaha model names (except U5 and U7) had the engine size (cc) in the first letter J=60, G=80, H=90, L=100, A=125, C=175 or 200, D=250, R=350 or 360, X=650, followed by the bike type T=Trail, S=Street, M=Motocross. It’s reed valves for everyone! Small or big, single or twin, come and get your free 20% more torque! Soon reed valves were on all two-stroke Yamahas. Their side badges proudly said “Torque Induction”. In the following few years Suzuki, Kawasaki and most other two-stroke motorcycles switched to reed valve induction. 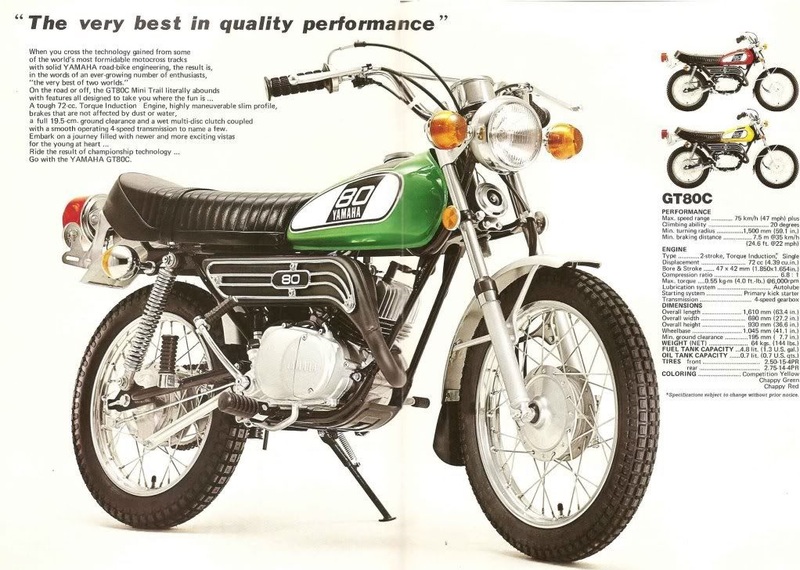 In 1973 the G7S, DT2, DS7, R5C were replaced by GT1, DT3, RD250, RD350 with reed valve cylinders and other improvements. 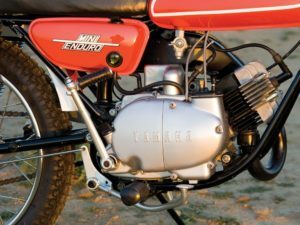 1973 was the beginning of standardized format model names, where the first two or more digits are letters that mean what model type, followed by two or more digits with numbers that mean what size engine. 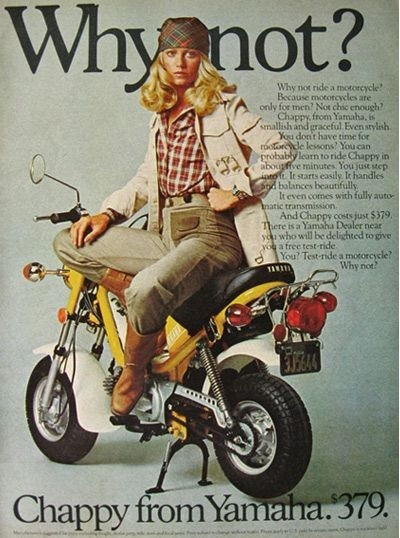 1974 was the “end of confusion” when all models names were standardized. 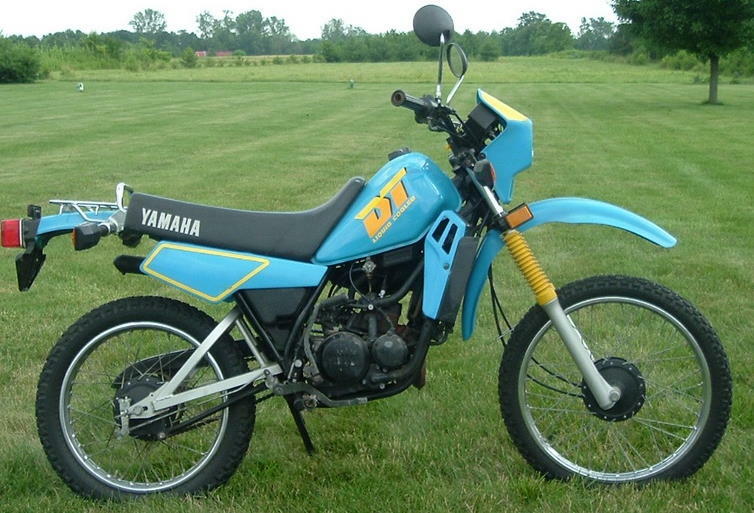 RD means Street, GT means Enduro, DT means Dual Purpose, TY means Trials, IT means Off Road, MX means Motocross, YZ means Motocross Racer, TZ means Road Racer, TX or XS means Street 4-stroke. The last 1 or 2 digits are the year and version. For the year, 1974 is A, 75 is B, 76 is C, and so on. Letters that might be confusing are skipped. 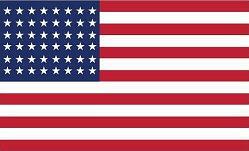 For 49-state and 50-state models, the version digit is blank. For California models it is C.
In this manner, the bike type, size and year are easy to see from the model name. In 1979 the Yamahopper QT50 was introduced. 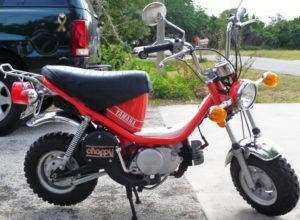 Here is a excellent article about the cutie on mopedarmy.com. Here is the QT50 Service Manual at QT50.net. That is where “all” QT50 info, love and links are kept. The Yamaha QT50 is the same design as Honda NC50 and Suzuki FA50. All three ultralights are similar, zippy, well made, and easy to ride. 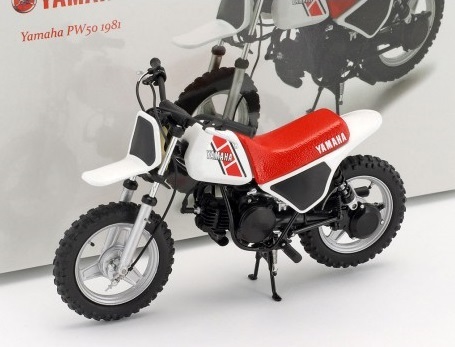 New for 1981 is the little kids Yamaha. 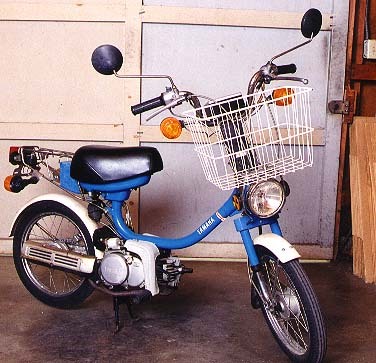 The PW50 Y-Zinger has the same engine and shaft-drive as QT50. 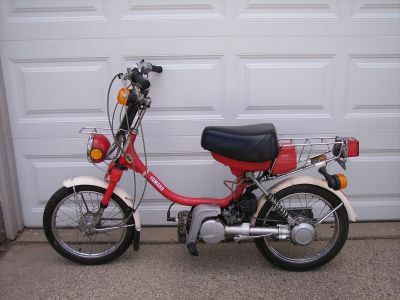 That’s right, shaft drive! 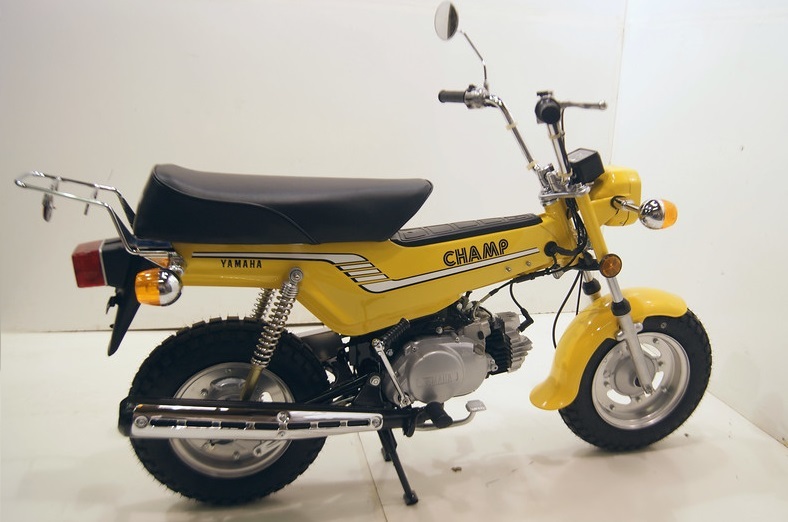 These are the only (common) 50cc motorcycles with shaft drive. They show and list every part for every US model Yamaha. They show and list every part for every Yamaha world wide. They list US model Yamaha scooters. Provided some scooter model name corrections to Partzilla. Some images can contain original bikes with correct make model and year in the title. Provided visual verification and some nick names. 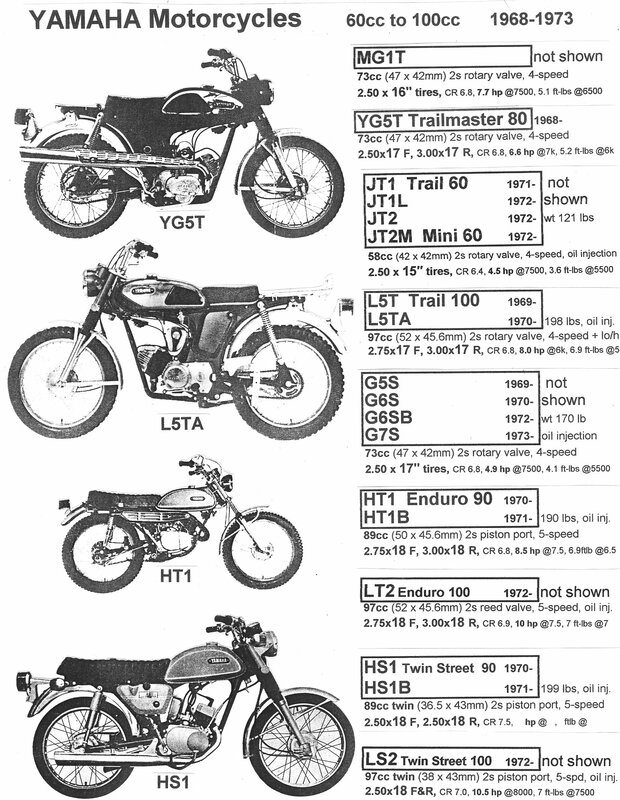 Service manual for 23 brands of vintage two stroke. Provided specifications, model names, porting, tuning. All of these sources were used to cross-check each model and year, and occasionally to make corrections. When one source disagreed with all of the others, it was was assumed to be wrong. So the info above is as correct as possible, but there still could be some errors or omissions. 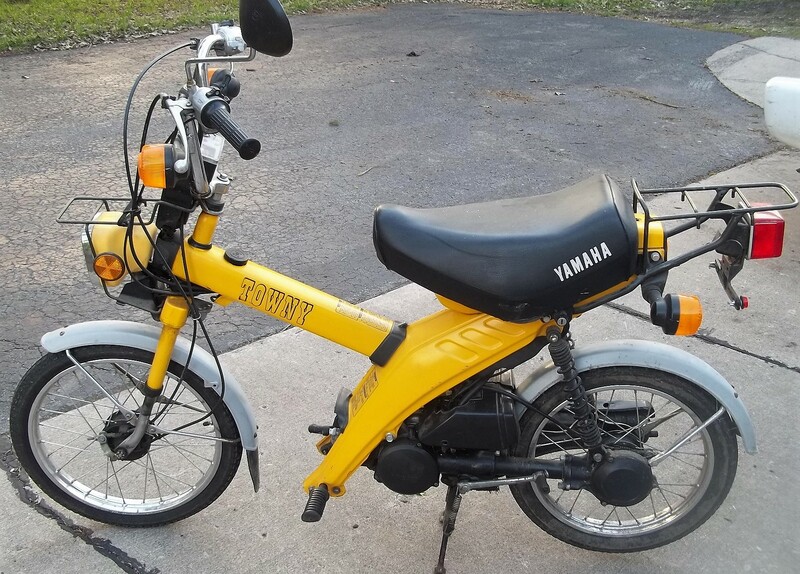 You are currently browsing the archives for the Yamaha Parts category.